As soon as you reach Lamai Beach, you are, at once, captivated by the breathtaking seascape. The scenery is just so spectacular – it must be shared with just about anyone who’s special to you. Not just through photos or selfies – but firsthand. Yes. The enchantment of Lamai Beach must be experienced not just by you or by a few. But by many. At Villa Jasmin, this is very possible. 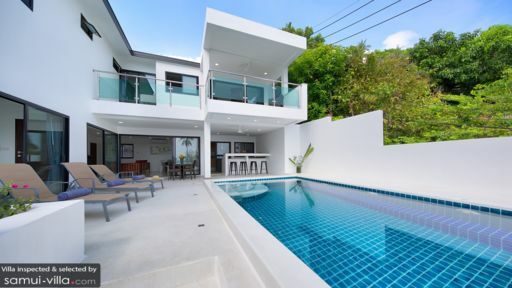 A three-storey luxury property rising on the shores of Lamai Beach, Villa Jasmin offers world-class amenities that can comfortably accommodate your extended family looking for some quality time together. Or your big group of friends on a break for some vacation bonding. Villa Jasmin has four (4) Master Bedrooms. Three (3) of these are on the topmost floor. Each Master Bedroom opens to a fully-furnished veranda overlooking the ocean. Here, you can catch the magical sunrise in the early morning and by night time, you can wind down with some after-dinner drinks. Each Master Bedroom also has its very own bathroom. 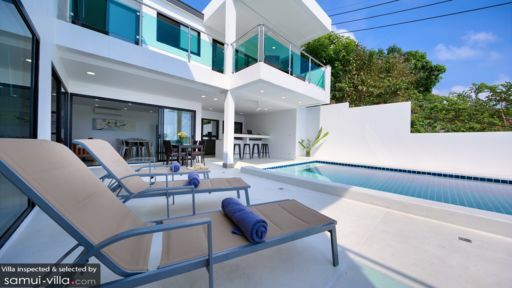 The fourth Master Bedroom is on the second floor which open to the Sun Deck as well as to the Living Area. On the second floor is a Sun Deck where everyone may converge. Enjoy water fun in the villa’s Infinity Pool. 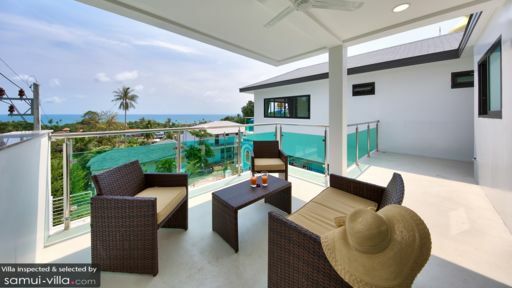 Or stretch out on the nearby Pool Beds and bathe in the morning sun as the cool morning sea breeze blows by. You can also take in the picturesque views of Lamai Bay seated by the bar sipping your favorite ice-blended drinks and, at the same time, engaged in amusing storytelling. Indoors, also on the second floor, is the Living Area. Here, your favorite TV shows are beamed via satellite to a large, flat-screen, LED TV. You may also dine indoors or al fresco – depending on your mood. The designated cook can also showcase his or her culinary prowess at the villa’s fully-equipped and ultra-modern Kitchen. Villa Jasmin’s Guest Management Concierge Team is always on hand and more than happy to assist you with your every need. One of the best in Samui Island, the team will go the extra mile to make sure that your stay is truly memorable. Lamai Beach is located on the southeastern coast of Samui Island. Aside from swimming and diving, you can explore nearby attractions such as the Hua Thanon Fishing Village, the Hin Ta and Hin Yai Rock Formations, Wat Lamai as well as Wat Khunaram where the mummified body of the monk Loung Pordaeng can be found. Why not go souvenir shopping as well? Head off to the Tesco Lotus Mall or to the Lamai Night Market. Every Sunday, Lamai Beach Road is closed off to traffic and transformed into The Walking Street. Here, stalls offer clothes, crafts and street food. Restaurants in Lamai Beach range from casual to fine dining and specialize in both local and international cuisine. The night life is vibrant – offering a variety of nocturnal pursuits.